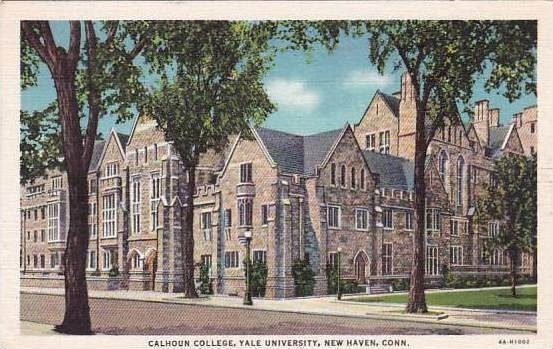 At the corner of Elm and College streets, and diagonal to the Green in New Haven, Connecticut is Calhoun College, one of the twelve undergraduate divisions of Yale College. The Gothic, weathered stones and leaded glass of Calhoun seem so solid and permanent that one might imagine it has stood there for ages. Yet Calhoun was only constructed in 1931-2. 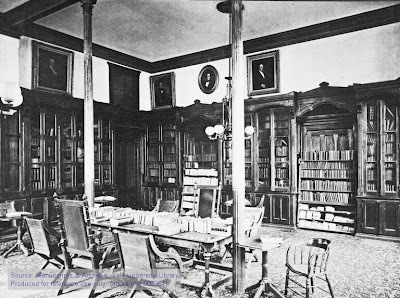 Its site has been integral with New Haven history since the Seventeenth century, and part of Yale since shortly after the Civil War. 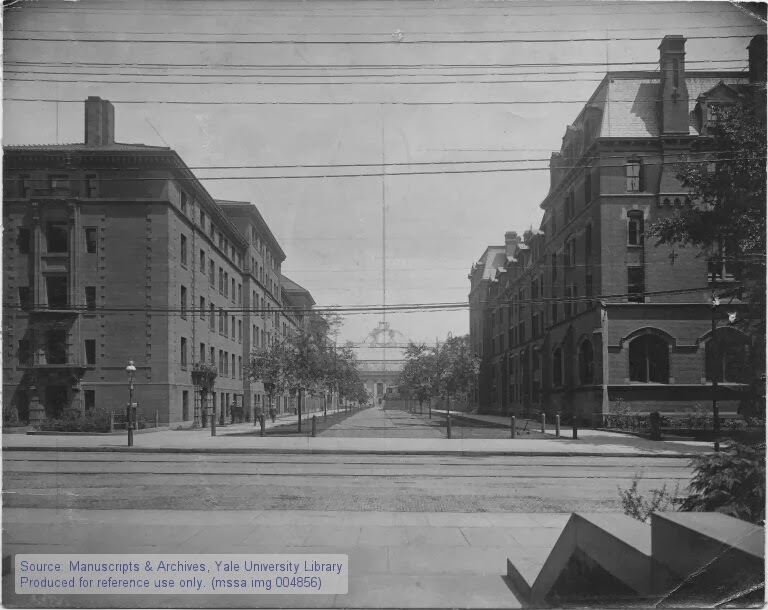 Fortunately, many early maps and photographs exist that allow us to peel back the layers of time, and reveal the early appearance of the Yale campus. 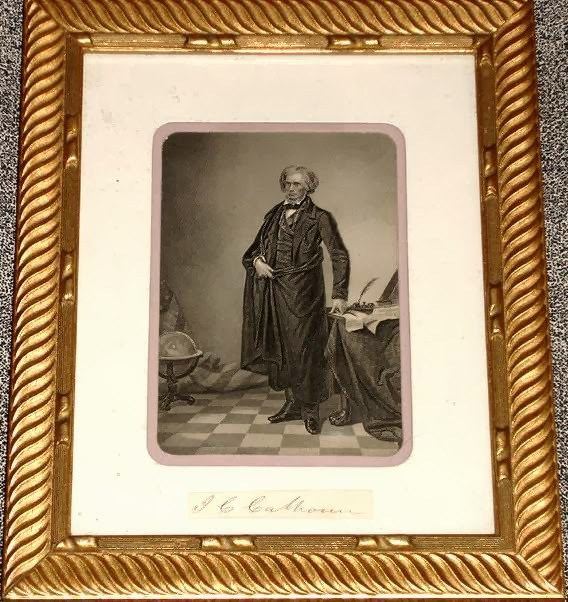 John C. Calhoun (1782-1850) was the seventh Vice President of the U.S., under Presidents John Quincy Adams and Andrew Jackson. He at various times served as Secretary of State, Secretary of War, and also Senator and Congressman from South Carolina. Since he was an 1804 graduate, Yale desired to honor his distinguished career by naming one of the colleges after him. 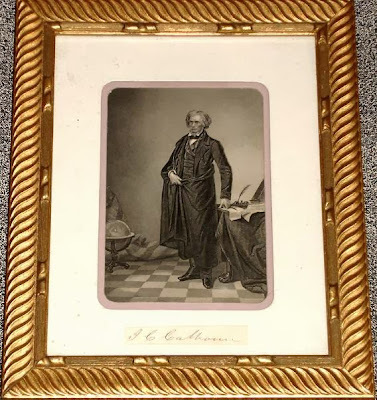 Unfortunately, Calhoun was virulently pro-slavery, so in recent decades especially there has been considerably controversy of the propriety of using his name. 3: Detail from 1748 map, Calhoun Site buildings shaded in red. New Haven was settled in 1638, and by 1641 the land on what is now College and Elm was the farm of John Brockton. By 1748, the Wadsworth Map (above) shows Innkeeper Mix established on the site, which remained an inn until the mid-Nineteenth century. 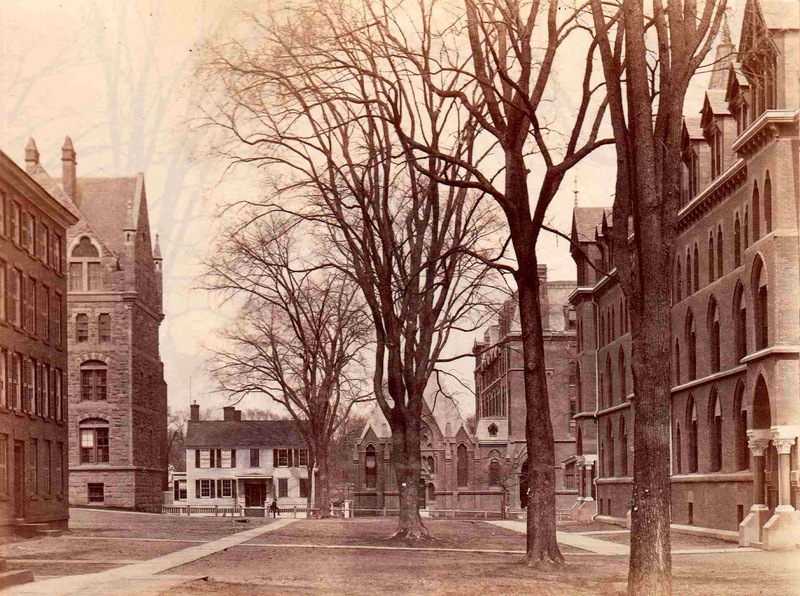 Note that on the Wadsworth map, Yale College was still a single building. 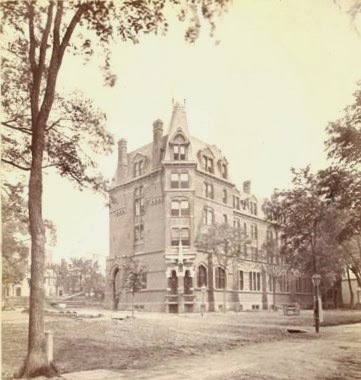 The Calhoun land was initially obtained by Yale to provide a new home for its Divinity School. 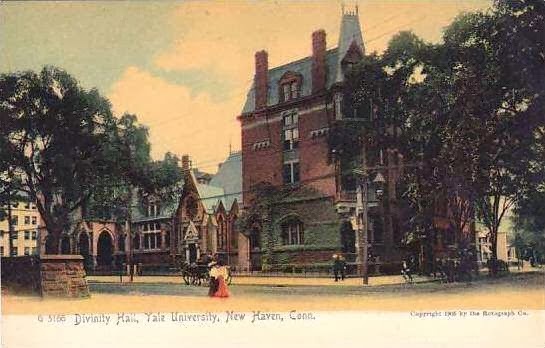 In its earliest days, Yale College was confined to the Old Campus block, bounded by College, Chapel, Elm and (later) High Streets. The famous Brick Row was started in the Eighteenth century, culminating with the construction of Divinity College at the Elm street end of the Row in 1835. 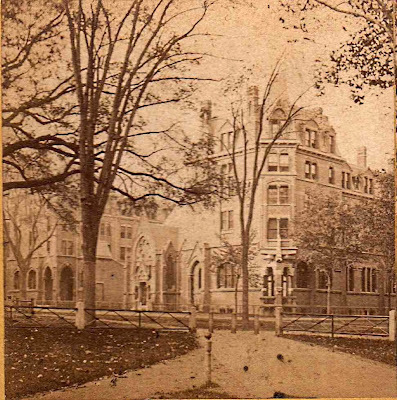 After the Civil War, a new growth plan meant the demolition of Divinity College in 1869 to make way for Durfee Hall (1870), and the Establishment of a new Divinity School across Elm Street. The first phase was the construction of East Divinity in 1869, designed by the acclaimed architect Richard Morris Hunt. 7: East Divinity + Marquand Chapel to the left. 1871 saw the addition of Marquand Chapel, also designed by Hunt. 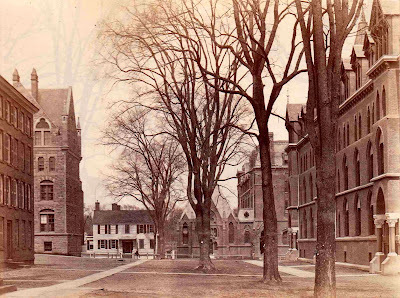 In this photo we can still see the early small white houses, so characteristic of New Haven, flanking the new Divinity School on both the College and Elm Street sides. 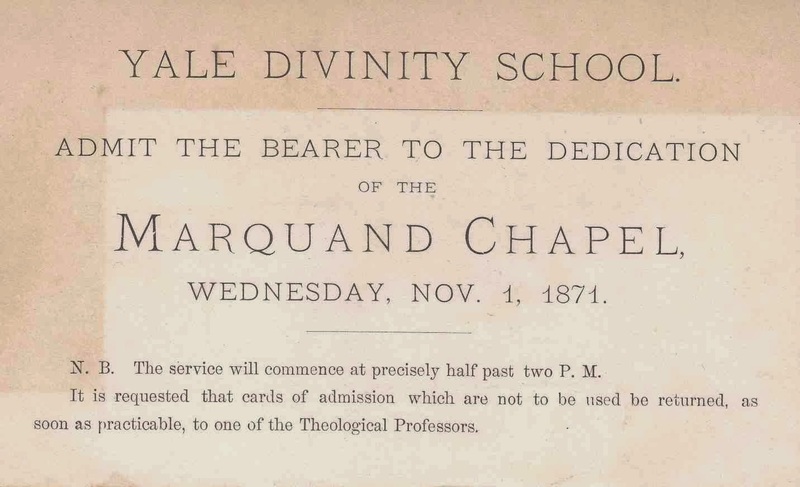 9: A special kind of luck favors collectors, one result of which was this obtaining this original admission ticket to the 1871 dedication of Marquand Chapel. 10: This is actually a palimpsest photograph, pasted on another; notice the faint elm branches in the background. Luckily, I have a copy of the underlying photo, which fittingly is a close-up of the Divinity School. 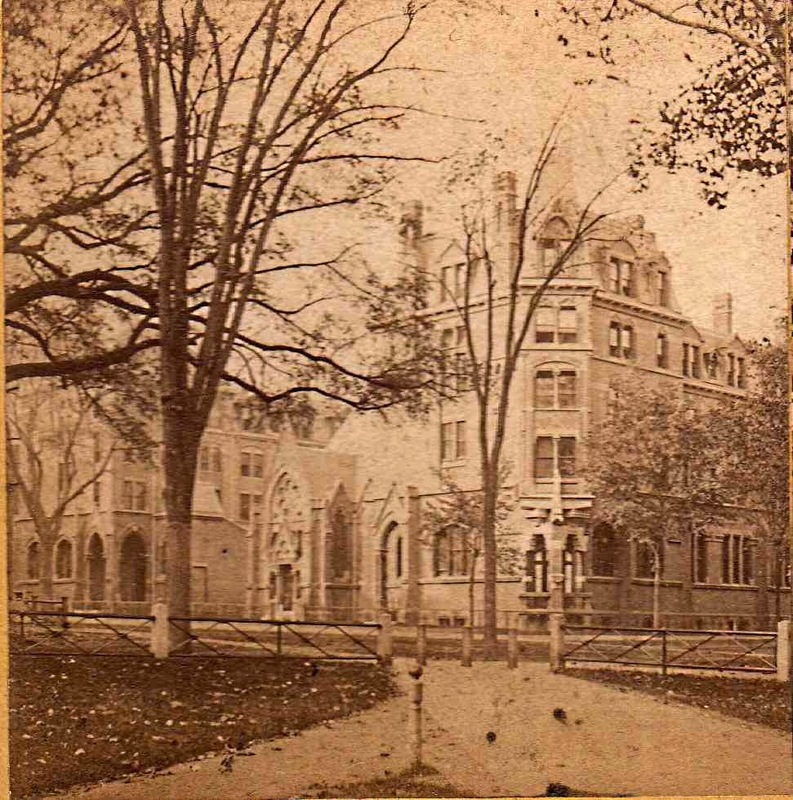 The above picture from 1873 helps make sense of the new Divinity School as seen from the Old Campus, taken in front of Farnam Hall looking across Elm to the new Divinity School and the future site of Calhoun. At the extreme left is North College dormitory (built 1820, razed 1901), part of the old Brick Row. Just beyond it is the brand-new Durfee Hall (1870), looking just as it does today. Across Elm Street, we get the best view of that early wooden house, reminding us that Elm Street was known as New Haven’s Quality Row. Marquand Chapel and East Divinity come next, then at the extreme right is a very recognizable and still-standing Farman Hall (built 1869). Because of Yale’s intensive building program, photographs of this period are often easy to date. 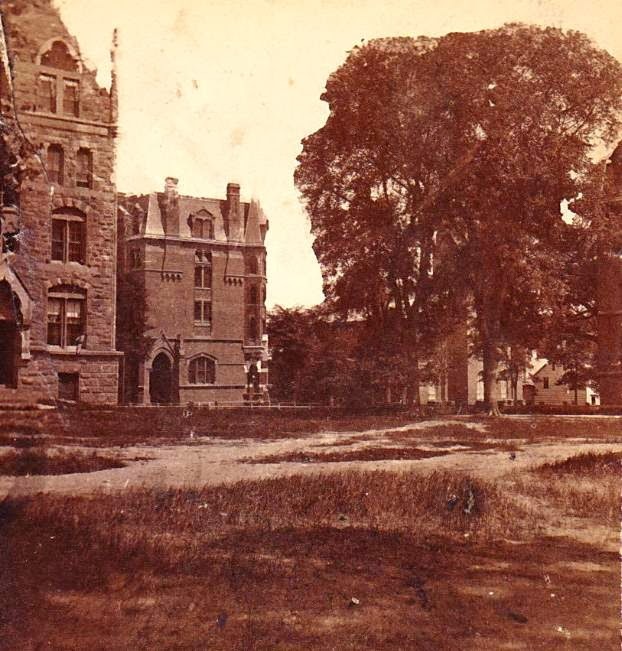 This photograph marked 1873 is readily confirmed, because it had to be taken after the construction of Marquand in 1871, yet the view across Elm Street is unimpeded by Battell Chapel, not built until 1874. This similar view taken at a different angle allows us to see, across College Street, two buildings which are still there: the First Methodist Church, and the Colonial house that is the current home of the Elihu Club, although not when the picture was taken, as Elihu was founded in 1903. Durfee and East Divinity are to the left, and a tiny sliver of Farnam on the right. 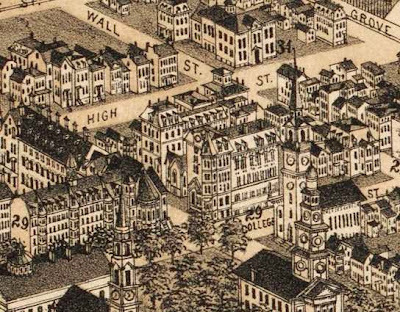 12: From a Bird's Eye View of New Haven, published by Bailey & J.C. Hazen in 1879. 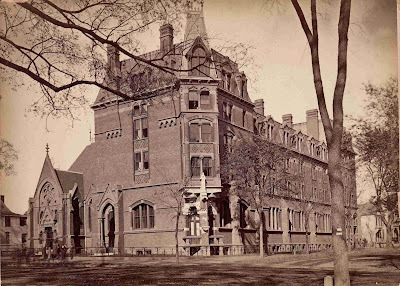 In addition to Battell Chapel, 1874 saw the construction of the West building of the Divinity School. This 1879 Birds-eye view, with the Divinity School is in the center, provides some context. On the left across Elm Street (unlabeled) is the edge of the old campus, showing Farnam, Battell, and Durfee. In the foreground is the New Haven Green, showing the Center Church (1812) and United Church (1814), both still standing. Notice the two particularly fine houses at High and Wall, and at College and Wall, both long gone. 13: By 1874, West Divinity had been added on the left, but there is still an available gap between West Divinity and Marquand. 15: Interior of Trowbridge Library--those windows face Elm street. In the 1890’s the Divinity School received some new neighbors. The houses on Elm Street to the west were replaced by the buildings of Berkeley Oval, the precursor of Berkeley College. In the above photo, West Divinity is on the right, and on the left is Fayerweather Hall of Berkeley Oval. Between them, the mall-like space was known as Blount Avenue, which still separates Calhoun and Berkeley. In the distance can be seen the University Dining Hall, built in 1901. 17: In 1911, the Noah Porter Gate was installed, which still serves as the entrance to the current Cross Campus. 18: What you would see taking a stroll on the Green in 1900. The above postcard seems to show the final development of the Divinity School on the site of the future Calhoun. Fayerweather is briefly seen to the left, and the colonial houses on the right have not yet relinquished their hold. All was soon to change when the College Plan for Yale went into effect in the early Twentieth century. A new Divinity School was built on Prospect Street past Science Hill, on the site of the former Winchester mansion. 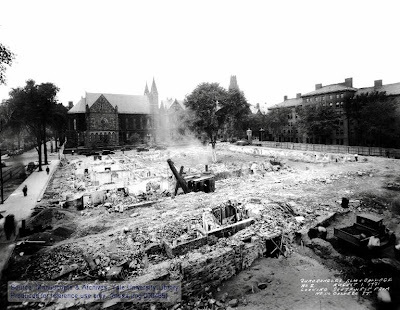 The old Divinity School was razed to make way for Calhoun College. 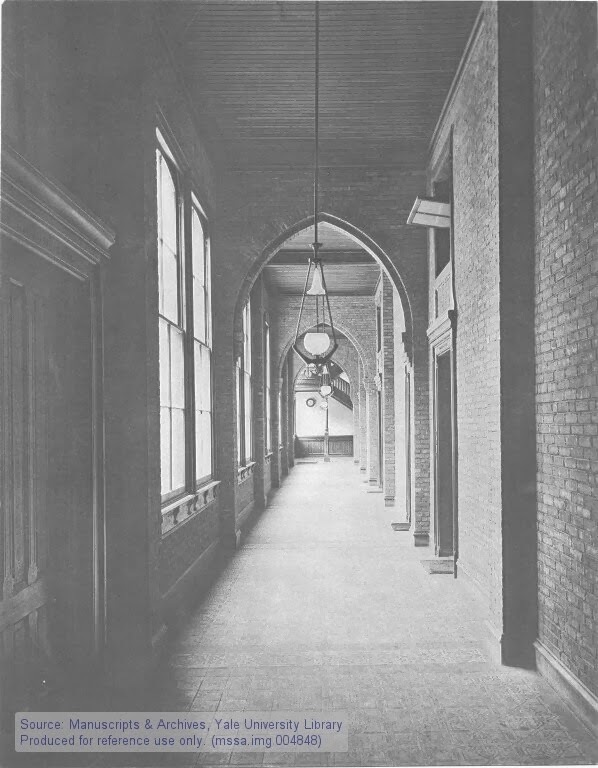 In the 1931 photograph below, looking towards College Street, all elements of the Divinity School are gone. Across College Street we can see Battell and Durfee, and a bit of Harkness Tower in the background. 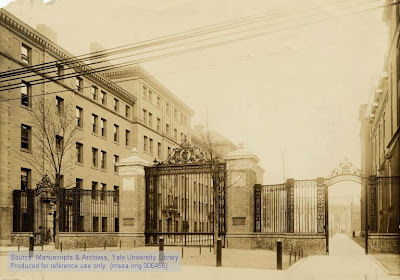 On the right are Blount Avenue, the Porter Gate, and finally Fayerweather Hall in its final days, as it would be torn down in 1933 to make room for Berkeley College. 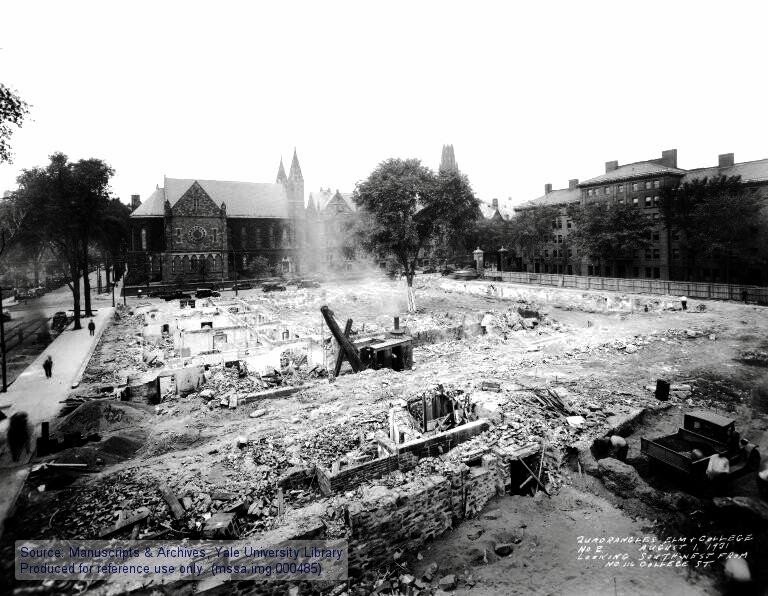 19: The End of an Era: This dramatic photo shows the demolition site of the Divinity School, and the future site of Calhoun. Notice the one legacy--the Calhoun Elm carefully protected by boards! As a student in Calhoun, I was completely unaware that it occupied the site of the Divinity School that had stood there not that long ago—even within my grandparents’ lifetime. It is a shame that such a large part of Yale's history has been virtually forgotten. Other than in these old photographs, no vestige seems to be left of the building that inhabited the corner of Elm and College for six decades. I will take a good look at Calhoun itself the next time I am in New Haven. Perhaps in the stone carvings that adorn Calhoun are hidden some reminders of its historic predecessors. A note on the images: It is my hobby to collect photographs and other ephemera that document the Nineteenth-century history of Yale University and the city of New Haven. These have been augmented with images from the treasure-trove at Yale Manuscripts and Archives, and from the Leventhal Map Center at the Boston Public Library. Photos 3 and 12 from Leventhal Map Center of the Boston Public Library. All other photographs and objects are from the collection of the author. 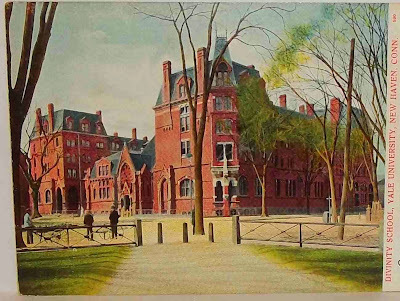 I would understand if New Haven had been bombed during a military bombing invasion, but it was a magnificent and intact campus spread out with green spaces. And they didn't want more modern architectural styles since they seemed to return to neo-Gothic every decade. Those postcards are treasured relics. Hello Hels, There were several dynamics that accounted for Yale's constant replacement of buildings. First, as an ever-growing university in an urban area, replacing smaller, older buildings with larger ones seemed an efficient choice. Also, Yale has had a number of guiding visions over the years, which often conflicted with existing buildings and spaces. In the early 20th century, the model was Oxford and Cambridge, so Victorian Gothic gave way to Collegiate Gothic. Moreover, the Divinity School was no longer as central to the University as in former days, and Yale wanted its residential colleges in relative propinquity to the central campus. Quite an interesting post and one wonders how many perfect and historical buildings have we lost here in the New World? It's a shame... New Haven was established back than in New Netherlands. Interesting that you went to Calhoun as a student! Hello Mariette, Yes, it is too bad that buildings are considered so disposable in the United States, even ones that are historic or beautifully made. At least in Calhoun's case the removal of the Divinity School was for a new building of merit, not for a parking lot or fast food restaurant, as is all to often the case these days! This was fascinating. I love the way you put it together with the old photos and postcards. 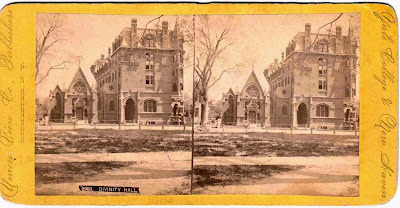 I hope there is some remnant of the old divinity school at Calhoun--it seems sacrilegious to completely destroy it; though from your photo that's what it looks like happened. How interesting that the "new" Calhoun was built in that gothic style. I've seen it and it's quite imposing--made me think of Cambridge (England). I look forward to learning more. Hello Jen, Old photographs always have a story to tell, that can be brought out with a little research. I did ask a few people at the new Divinity School if there any fragments lying about, but so far have not turned up anything. Calhoun reminds you of Cambridge for a good reason--the architecture was based on Cambridge and Oxford, as well as the residential college system itself. I'm not complaining--a great deal of Yale's charm comes from its Collegiate Gothic architecture. Dear Jim - others have mentioned how much the buildings remind them of Oxbridge, and that is very noticeable in the redbrick gothic style of Trowbridge Library. It bears a strong resemblance to my granddaughter's Oxford college, Keble. It seems that in the past many fine buildings were demolished to make way for new. Today there seems to be a greater awareness of buildings' historical and architectural merit. These photographic collections that throw light on the development of our great institutions are a very valuable resource. Hello Rosemary, Your granddaughter is lucky to attend a great university steeped in history. I just looked up the history of Keble College, and it was founded in 1870, making it very contemporaneous with the building and development of the Yale Divinity School. Many of the buildings at Yale have been replaced three or four times. That is what makes collecting and interpreting these old photographs so interesting, because each contains elements from different periods. I really should add that despite so much demolition, Yale still has one of the greatest collections of old buildings, and it is a pleasure to walk around the campus. It must have been a pleasure to have attended a school with so much history, tradition and atmosphere. I attended Carnegie Mellon University, although it was still Carnegie Institute of Technology when I applied. Its history only extended as far back as 1912, but it was fun to be immersed in Scottish traditions and to learn all things relating to Andrew Carnegie. Incidentally, I recently read a surprisingly fascinating book on the under-estimated James Knox Polk, "A Country of Vast Designs," by Robert W. Merry. John C. Calhoun figures prominently in the story, and I highly recommend the book to you! Hi Mark, I loved visiting the Carnegie campus when I was in Pittsburgh, and somewhere I have some great older photos of the university. The Polk book, about the Mexican War, looks fascinating. I just added it to my list for the next visit home. So many machinations went on before the U.S. finally extended from coast to coast. I'll be interested to find out how creditably Calhoun comes out. By the way, I see that your new thumbnail photo must be the first of the sweeping changes that we are so anticipating! Yes, the Duke of Urbino may not be fully retired, but he is taking a sebatical. Ha! Ha! Mark--It took a few seconds for that comment to register! PS - I love seeing the elms in these early photos. Unfortunately many are gone as we all know. New Haven is known as the Elm City, so the blight struck there especially hard, although it is still a good place to see elms. The elm tree in the last photo was still in place in the courtyard when I was there, with a tire-swing hanging from it, but I heard that it finally succumbed a few years ago. Hi Loi, Yale has an incredibly beautiful campus, so don't pass up a chance for a tour. Your new house in Castine makes an incredible base for just the sort of historic landmarks and buildings you mention, either in old photos or in their present incarnations. I am sure that as the weather improves you will be regaling us with all kinds of photos and stories involving Early American history. Hi Reggie, The back-story of Battell Chapel, a Civil War memorial not built until 1874, will make an interesting post on its own some day. One of the early designs was by Calvert Vaux. Interesting that you lived in Farnam--I guess by that time, at over 100 years, it was due for a renovation. Lucky for all of us that you escaped those collapsing ceilings! I didn't know about the plans to eliminate part of the current Divinity School, but it doesn't surprise me. Not only are the buildings very beautiful, but their placement on the grounds creates an oasis of calm that seems especially appropriate for a theological school. Removing part of the plan would most likely wreck the whole. One hopes that Yale has acquired some lessons and experience from all this, but perhaps they have not. The first thing they did when planning for the new residential colleges a few years ago was to tear down beautiful century-old Hammond Hall, as well as more of those substantial 19th century houses for which New Haven is famous. What a fascinating and detailed account you give here of this particular aspect of Yale's history. And, it is all so delightfully illustrated with the wealth of intriguing archive material which you have collected over the years. This really is a most impressive collection of ephemera and does afford some amazing insights into the history of Yale and its buildings. It is always fascinating to learn about these ancient University foundations since one can almost walk in the footsteps of those who have gone before. For us, we continue to be drawn to Oxford and Cambridge for these very same reasons. It is great to have this glimpse into Yale through your eyes. We hope that you are well. Thank you so much for your warmly welcoming comment. We have missed so many of our blogging chums, especially those to whom we feel a particular affinity such as you. Hello Jane and Lance, It is wonderful to hear from you again. I am glad to learn that your hiatus has been busy and productive. I collect Yale and college photos in general, not Calhoun in specific, so it was fascinating to see the idea for this article crystallize when examining all the photographs. It is furthermore notable that the 1870's Divinity School was so well photographed; it seems that the students of the period were proud of the building and wanted to commemorate it. I like your comment about walking in past footsteps. This is always an evocative part of visiting old buildings, but a lot of the fun and interest in research is in recreating a vanished landscape. What a captivating history lesson Jim. It's all so British in a way, just without the centuries behind it. Hard to believe that much of it is still under 100 years old and in such a short time, achieved such an excellent reputation. You always amaze me. Thanks Jim. Hello Di, Yale in the 20th century was certainly British by design--not only the buildings, but also many of its ideas and directions were Anglophilic. 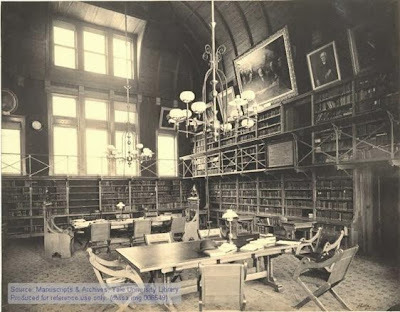 For example, about this time Yale was forming one of the great collections of early English literature, now divided between the Beinecke and Sterling Libraries, and more recently a Horace Walpole library out in Farmington. What a beautiful reconstruction of some forgotten history! I don't remember hearing any of this on the Yale Tour or in my four years in New Haven. As a former resident of Calhoun, and I look forward to reading the next installment! Also, what beautiful irony that Yale's first African-American college master was master of the college named after John Calhoun. 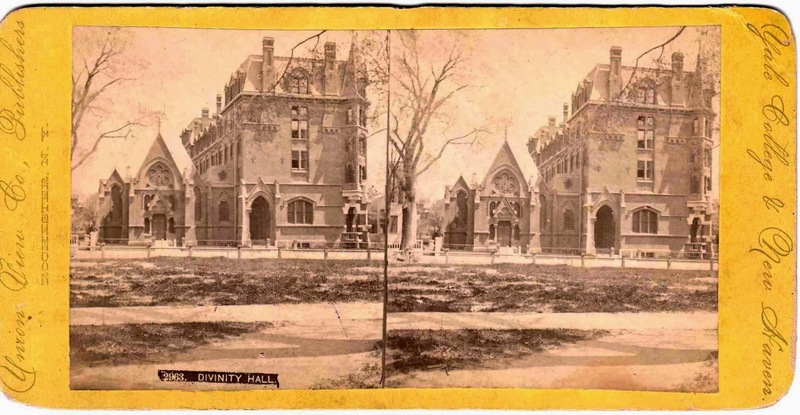 Hello Petite-ish, Yale has a fascinating history that predates its Gothic Revival days, and one learns a great deal about it through collecting artifacts like photographs. Are you referring to Charles Davis? In addition to providing ironical balance, the Davises were both distinguished and kind people who added a lot to the life of Calhoun.